The GROHE Eurosmart Cosmopolitan single-lever bath mixer – dynamic design and performance you can afford! Your bathroom look will be enhanced by the chic wall-mounted GROHE Eurosmart mixer for the bathtub – and all without busting your budget. Operation is via the tactile solid metal lever while the automatic diverter lets you switch easily between bath and shower flow. The GROHE SilkMove ceramic cartridge offers smooth and precise volume and temperature control for the life of the tap. And, to help you save water, the Eco-Override-Stop function offers subtle resistance when you lift the lever beyond the most efficient water-saving flow rate. Finished in hardwearing GROHE StarLight chrome this mixer will sparkle for years to come. 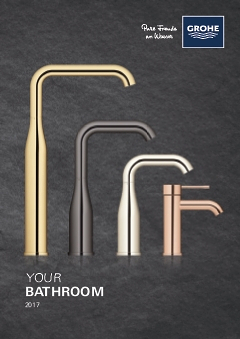 GROHE Eurosmart Cosmopolitan – affordable bathroom style and functionality.